First, the river that runs through Santiago has parks all along it. Moreover, wherever there was room on the other side of the street, the park went there too. There were guys out every day hand-watering the grass and cleaning the parks. If I had time, I would have loved to walk across Santiago by following the never-ending park. 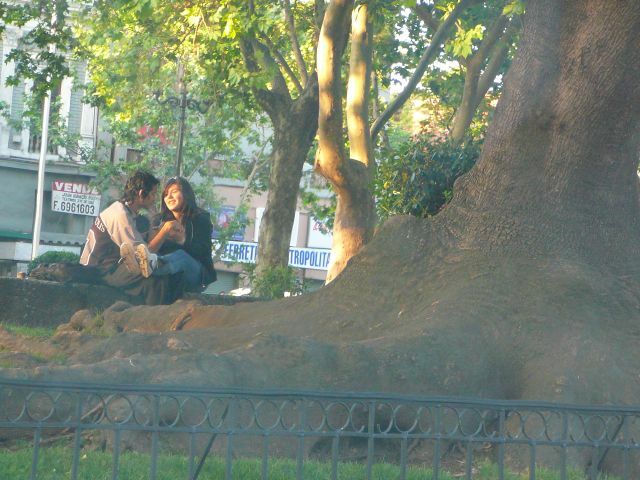 Second, public shows of affection are incredibly common in Santiago! When couples meet on the street, they give each other a kiss that... Well, you wonder if they're going to stop at the kiss, it's that passionate. All over the parks you'll find couples embracing and cuddling. They call Paris the "City of Love". I've never been there, but my wife has. She says Santiago can hold it's own against Paris any day.